Where did you come from where did you go? 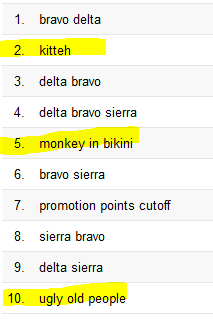 In an effort to better understand our audience I was checking out our traffic logs this morning. I gave up after a few moments of confused head scratching. Here’s why. Damon wrote a similar post to this a couple of years ago. All I know is that I think somebody should be ashamed. I’m not sure who. We have started posting new toons to Twitter (again). If you are a Twitter-er, follow @DBSpao for the latest. Of course we are very active on Facebook as well.